Failautusi Avegalio, director of the Pacific Business Center (middle of photo) and C.L. Cheshire, senior business development manager (second from left) receive the University Economic Development Association 2014 National Award of Excellence at the UEDA 2014 National Summit in Santa Fe, New Mexico. A University of Hawaiʻi project to promote and expand breadfruit use in the Pacific has won a top award from the University Economic Development Association (UEDA). The Pacific Regional Breadfruit Initiative, a project of UH’s Pacific Business Center Program (PBCP), won UEDA’s award for research and analysis in Santa Fe, New Mexico. Accepting the UEDA Award of Excellence was PBCP’s Senior Business Development Manager C. L. Cheshire and Director Failautusi Avegalio. Avegalio attributes the Pacific Regional Breadfruit Initiative’s success to the groundbreaking research and analysis led by the National Tropical Botanical Garden Breadfruit Institute and its Director Diane Ragone. 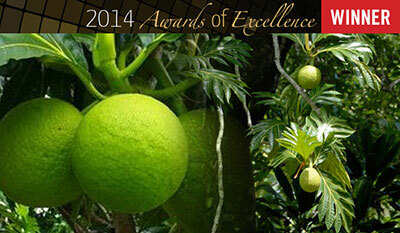 That research affirmed the many uses of the breadfruit tree and fruit, or ʻulu, in Hawaiian. According to Avegalio, breadfruit is gluten-free and the U.S. market demand for gluten-free products is projected to hit $15.5 billion in 2016. Major byproducts of breadfruit include the breadfruit sap that is 100 percent organic latex, and the breadfruit flower, which contains several powerful chemical compounds more potent than those used in the leading synthetic insect repellent on the market. The tree’s wood is resistant to marine worms and termites. The breadfruit tree also has a high salinity tolerance, enabling it to survive inundation from rising tides where traditional food crops such as taro, banana, tapioca and yams cannot. “There is no better combination for natural food security in the world than breadfruit, together with the coconut tree for water,” said Avegalio. PBCP envisions Hawaiʻi as the major processing, refinement and export hub to the U.S. market for sustainable and gluten-free food products, such as flour made from breadfruit. The Commonwealth of the Northern Marianas Islands would serve a similar function for the Asian market. Support from the Ulupono Initiative of Hawaiʻi helped to launch the Pacific Regional Breadfruit Initiative’s inaugural Breadfruit Summit in 2012. There will be a Melanesian breadfruit summit in early 2015 and a Pacific Regional Breadfruit Conference is being planned for October 2015 in Hawaiʻi. Read the University of Hawaiʻi news release for the full story.